President Ronald Reagan's handwritten changes to his "Evil Empire" speech, his correspondence with Mikhail Gorbachev and a bronze cast of Moscow's Kremlin from the onetime Soviet leader are going on rare public display at the National Archives. A small collection of items unveiled Wednesday will be part of a yearlong rotating exhibit of Reagan documents and objects opening Friday to mark the 100th anniversary of Reagan's birth on Feb. 6. The first items illustrate Reagan's foreign affairs philosophy of "peace through strength," said Sharon Fawcett, head of the Archives' Presidential Library system. Future items will focus on Reagan as a communicator, his Western roots and his personal style. "President Reagan spoke in a way that the American people could understand," Fawcett said of the 40th president, who died in 2004 at age 93 after suffering from Alzheimer's disease for nearly a decade. 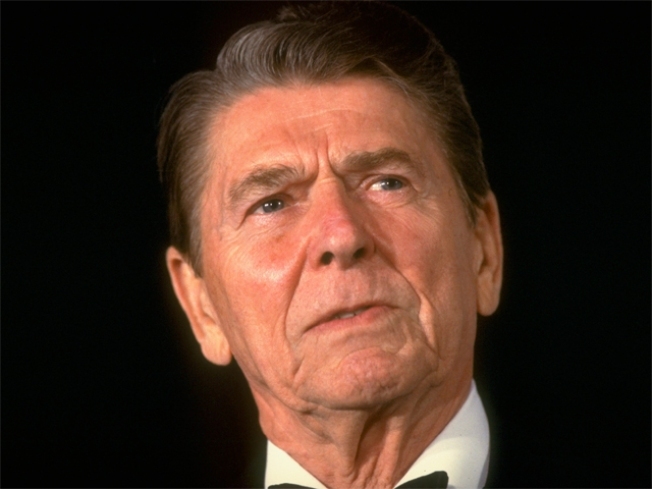 Elected in 1980, Reagan first declared the Soviet Union an "evil empire" in a 1983 speech before the National Association of Evangelicals in Florida to argue against a "nuclear freeze" on both the U.S. and Russian sides that Congress was considering and some religious groups had endorsed. Reagan didn't believe the Soviets would honor such an agreement. Reagan Presidential Library Chief Archivist Mike Duggan said the president's handwritten changes to the speech show he was intimately involved in communicating about foreign policy at a time when some said the former Hollywood actor was simply reading from a script. "When he said the Soviet Union was an evil empire, he meant it at that time," Duggan said. The phrase would be repeated in politics and pop culture, making it one of the Republican president's best-known lines. "But at the same time, he was willing to say 'Let's keep talking, let's keep talking,'" Duggan said. One change Reagan wrote into the speech explicitly sought to keep an open dialogue. "This does not mean we should isolate ourselves and refuse to seek an understanding with them," Reagan wrote in between lines of typed text, crossing out other language. "I intend to do everything I can to persuade them of our peaceful intent." Other items document Reagan's personal diplomacy with Gorbachev and other leaders of the since-disbanded Soviet Union. They include the first-ever public display of Reagan's "talking points" prepared for his meeting with the new Soviet Foreign Minister Eduard Shevardnadze in 1985 as well as a letter from Gorbachev in 1986 concerning the lack of progress in negotiations. The bronze cast of the Kremlin was a gift from Gorbachev after Reagan's visit to the Soviet Union in 1988. The Archives also is displaying fragments of U.S. and Soviet missiles that were destroyed as a result of the first treaty that eliminated a class of nuclear weapons, Duggan said. That will show visitors the evolution from Reagan's "evil empire" message to another signature phrase from his foreign policy: "Trust, but verify."